Swap spreads are excellent coincident and forward-looking indicators of the general health of the financial markets and the economy. (See my short primer on the subject here.) They are therefore one of the most important indicators for investors to follow. The news of late has been mixed to negative, with a modest pickup in growth in the U.S. economy overshadowed by increased tensions in the mideast, weak economic growth in Europe, the return of the "Grexit" problem (the potential for a default on the part of the Greek government, or a decision to leave the Euro), the collapse of oil prices (which has threatened the economic viability of Russia, Venezuela, and heavily indebted oil companies), and the ongoing slowdown in China (which nevertheless continues to grow at a pace that would be the envy of every other nation on the planet). On net, markets have gotten worried, as I've noted in many numerous posts of the "climbing walls of worry" variety. The chart above emphasizes the role of Quantitative Easing in both the U.S. and Europe. QE's major impact was directed to the financial markets (not to the economy, as so many assume), since QE basically involved the provision of liquidity to the banking system: the Fed purchased notes and bonds and paid for them with the issuance of bank reserves, which are functionally equivalent to T-bills. 2-yr swap spreads. Banks needed liquidity and the world's investors were desperate for safe asets—both were in very short supply—and QE addressed that problem. But QE1 and QE2 were both ended prematurely, as evidence by the widening of swap spreads that occurred around the time of their demise. QE3, on the other hand, ended at the right time. Swap spreads have only increased marginally since the end of QE3, mainly because of the concerns surrounding Greece, falling oil prices, etc., that I mentioned above. 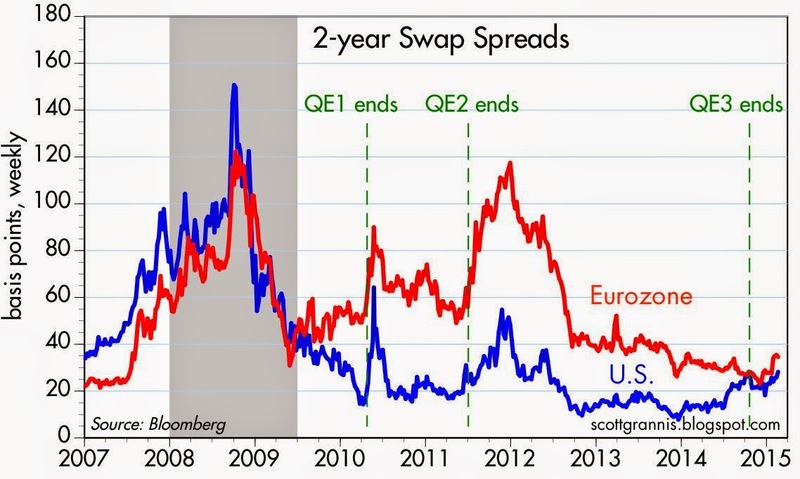 The current level of swap spreads is fully consistent with "normal" financial market conditions. 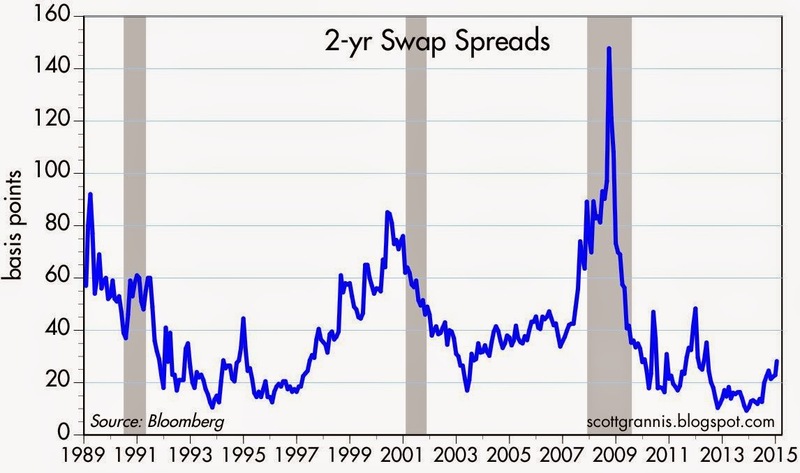 The chart above shows 2-yr swap spreads in an historical context. Here again we see that the current level of spreads is relatively benign. The world's investors may think there is a lot of risk out there, but swap spreads tells us that the financial system is able to support the risk. Markets can manage risk very efficiently if the government refrains from intervening. The biggest source of risk these days, arguably, is the stress that many oil producers are feeling as the result of the almost 50% decline in petroleum prices since last summer. 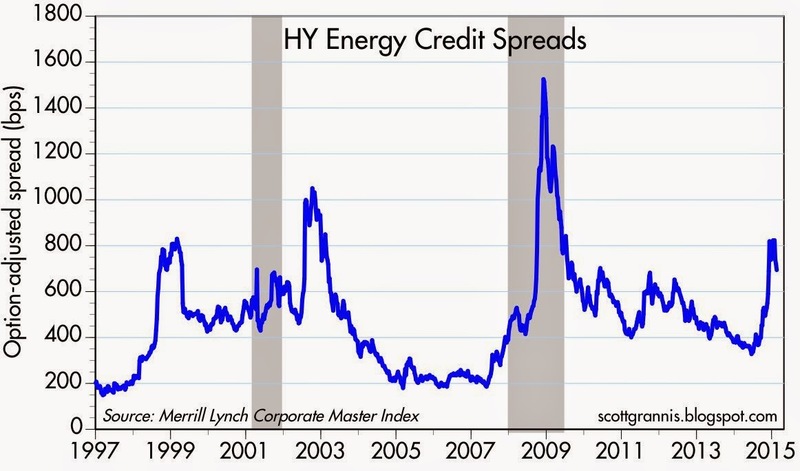 Spreads on high-yield, energy-related debt spiked several weeks ago, but have since subsided somewhat. Oil prices have stopped declining, and the market has had a chance to better assess the risks involved. The oil industry is facing a big problem, but at this point it does not look like it will intensify or prove contagious to the rest of the world. 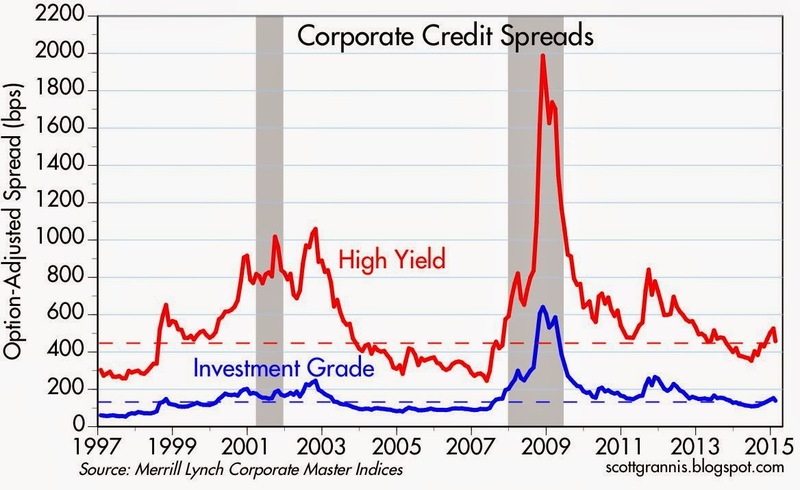 The chart above shows the average level of credit spreads for investment grade and high yield debt. Spreads are up from their lows, but they are still quite low from an historical perspective. On balance, therefore, swap and credit spreads in general are telling us that the likelihood of a major economic or financial market collapse is very low. We are not on the cusp of another recession or another Great Recession. We're more likely in the midst of the sort of one of the run-of-the-mill problems that beset markets from time to time and that are eventually resolved without serious consequences. I have heard this expression a few times---the world has a "shortage" of safe assets. The bulging and innovative free capital markets cannot generate assets to meet market demand? I find that incredible. First loans on good property with low LTVs? Even in this last bust, property did not go down more than 50%. And I am not sure why someone would sell a Treasury bond (which is safe) to put money in the bank (safe up to FDIC insurance limit). There is safety in short-term instruments, or cash, against interest rate hikes, but I sense we are talking credit risks. I am glad Scott Grannis now agrees QE1 and QE2 should have been bigger, harder and longer. Q3 too? I think so---the real question is should QE become conventional monetary policy. Ongoing, or automatically kicks in when certain conditions are reached, such as inflation to low, or real growth too slow. The Taylor Rule was great but fell apart when we got to ZLB. You cannot have negative interest rates. I think automatic cuts in FICA taxes, offset by QE-financed bond contributions to the Social Security and Medicare funds is the way to go. Despite everything, no nation that went to QE has seen anything except better growth and little inflation. Japan, Britain and USA. QE does not work in theory. It seems to work in practice. Can one still get a quote and chart for interest rate swaps on Bloomberg? I can't seem to do it.